I knew of but have never looked into any of the Warhammer 40,000 stuff. I mean I'm a nerd and all of that, but for some reason Warhammer always seemed to be at a different level of nerdiness than I was prepared for. I remember looking around in a hobby store a whole bunch of years ago and seeing just tons and tons of pewter miniatures in support of the game. They looked neat, to be sure, but it all just seemed too overwhelming. Besides, I was more into video games and figured if Warhammer was that good there would be video games based on it at some point. Well there have been a few here and there but certainly nothing that made me sit up and take notice. 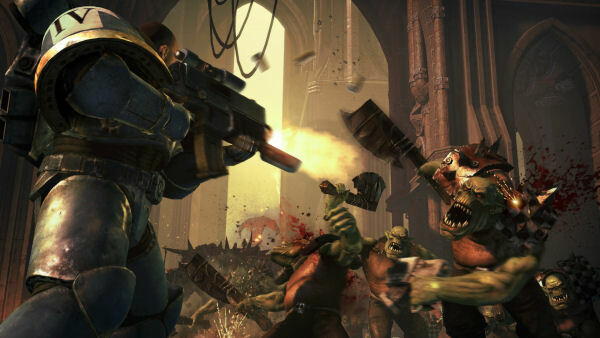 But now THQ and Relic are trying to change that by bringing a bit of The Games Workshop universe to a PC or console near you with their title Warhammer 40,000: Space Marine. 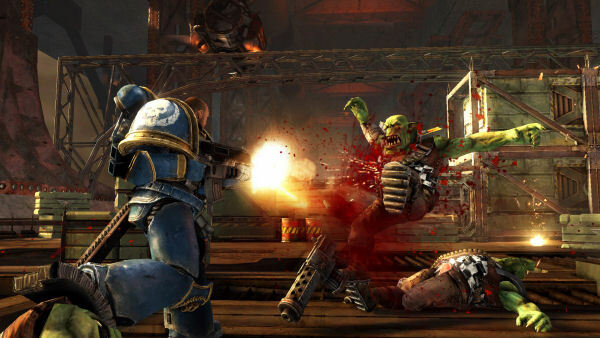 Warhammer 40,000: Space Marine has you playing the role of...well, a Space Marine. Fanboys can argue who stole what idea from whom in video games but the idea of a very powerful super solider has been done many times. Many will say that all of these uber-warriors come from variations of the Space Marines in the Warhammer series, and they may very well have a valid point. However that doesn't really matter to me. All I care about is having fun in a game, regardless of where the original source material came from. So it is that in mind that I approach Space Marine and I must say that I did have a good time. As mentioned you play the role of a Space Marine, more specifically an Ultramarine named Captain Titus. This is my first introduction into the Warhammer universe and it seems that Space Marines are very well know to all of the inhabitants of that universe. I could not go more than a few minutes of game time without hearing someone/thing cry out “Space Marine!”. I'm not totally sure if that was just part of Relic's attempt to hammer in the title of the game, or if the Orks and other creatures are just that awed at seeing you and your crew. Captain Titus and the other Space Marines are certainly impressive as they seem to be roughly nine feet tall and have enough armor on to be classified as a tank in most militaries. The game does a good job of representing your mass with some heaving stomping sound effects and occasional screen shaking when you're running. The game is a third-person shooter plain and simple mixing up close combat with a little range weaponry. The story involves a bunch of green dudes attacking a planet. It turns out that this particular planet develops an impressive super weapon of some sort and the Space Marines are sent in to protect the weapon and to get the little green guys (Orks) to go away. There are a couple of twists and surprises in the story, but the real draw is the action not the narrative. However, even though the story wasn't terrible, I would think that those familiar with the Warhammer universe might find the story more interesting than I did. These Space Marines are certainly nothing to mess with and there are plenty of times that you will feel all-powerful. It is not an uncommon occurrence to find yourself in combat with 20-30 enemies at once all at close range. A typical encounter will start with you and two other Ultramarines waltzing into an area and seeing numerous bad guys waiting around. While they are still far enough away you can thin out the herd with some gun fire or grenades. Once they get close enough it is time to introduce them to your Chainsword, Poweraxe, or Thunderhammer (love that name!). Regardless of your weapon choice there is a good chance that you will cause a lot of bloodshed, and that is the most enjoyable part of the game. The amount of damage and havoc you cause in these close quarter situation borders on the obscene...and I mean that in the best possible way. The world is a kind of standard location with bombed out buildings and various stages of war-torn destruction going on. It's interesting enough and the scale of things is pretty big. The game isn't very open ended, for better-or-worse, as you are often led down paths that funnel you right into the next area of action. The color palette is full of battle tested browns with your blue, often bloodstained, space marine standing out. The controls were standard mouse-keyboard combination with the option for a control-pad. I found myself getting disorientated several times near the beginning in battle and kept getting turned around with my back towards the enemy hoard and Captain Titus swinging away a thin air. But after a few skirmishes I got my bearings. The basic fighting style of peppering the bad guys with ranged weapons and then moving in for close combat plays throughout the whole game with a couple of exceptions like using a Jump Pack for some high-flying fun. Much like the single player campaign, the multiplayer is solid, though not very original. I honestly didn't get a chance to play the multiplayer a whole lot because I'm just more of a single player gamer. That said, it does have the traditional modes and I did find myself sticking around for another round more than I thought I would. The game is nice to look at even running on an average rig which is nice since there are not a whole lot of graphical settings to fiddle around with. I did have a few times when the frame rate with south but that was fairly rare and, naturally, when there was a whole bunch of action going down. There was one occasion where I thought the game had locked up, but it turned out that there was still one enemy hiding behind a corner that needed to be dealt with before an animation event could be completed. I did have some strange audio behavior when the sound would skip in and out, but I wasn't able to determine if that was a machine specific issue or not. Final Rating: 80%. Warhammer 40,000: Space Marine may not bring much originality to the third-person shooter, but what it does it does in a fun way and better than many.